More and more PPG pilots fly with rescue systems. The only known rescue system used in Powered Paragliding, is a manually deployed reserve parachute. Because of its complexity, Powered Paragliding compared to Paragliding or Free Flight, requires a different approach for a safe rescue system deployment. In any of these conditions, deploying a reserve, will always be irreversible. Before deployment, to decrease the probability of a complicated deployment, the engine should be shut off. Taking into consideration that the engine on the back of the pilot can additionally interfere with the successful deployment, I consider that sometimes, the pilot may not have time or could simply forget to kill the engine. In order to eliminate such a possibility, I designed and built a kill switch that is automatically activated when the reserve parachute is deployed. This system is very simple and effective. In principle, it consists of an electrical switch which is kept in "on" position by a cap. Once this cap is removed the switch will shut the engine. The cap is connected to one of the reserve's bridles. 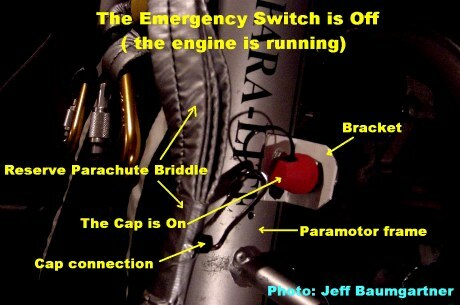 Once the reserve is tossed, the bridle will automatically separate the cap from the switch which will shut off the ignition and stop the engine. 3) An emergency kill switch, in case of an emergency reserve deployment or an accidental deployment. In any of these cases, it will automatically kill the engine. The switch is a common tether switch from a snowmobile or jetski dealer and it simply grounds out the ignition coil if the cap is removed. 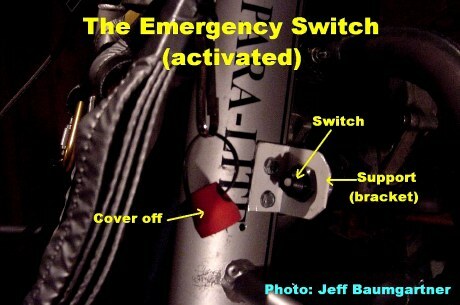 Care must be used in the placement of the switch, as to not cause an engine out. Situating the switch will depend on the reserve's bridle routing. On a "steerable" reserve such as the Quantum 440 shown in the picture, one must make sure not to tie all of the risers together with anything that will bind or damage the riser upon deployment.